How to Design Backyard landscape? Do you have a backyard? Then continue reading and you will find some amazing ideas for designing and constructing your own backyard water garden. It could make your home stunningly gorgeous. In addition to great looks, there are also other health and environmental benefits of having a backyard water garden. Keep reading to find out. If you have a backyard, you could easily turn it into a gorgeous garden with fountains, pools, and flowers. A water garden can turn your backyard into a relaxing haven that everyone can enjoy. You could raise fish, grow vegetables and also create a great place for you, your friends, and family to come together and enjoy. Another huge benefit of having a backyard water garden is that, you could grow your own food in it. It would lower your grocery bills, improve your health, and also help the environment. Below are some step by step instructions and some ideas for building a stunning backyard water garden. So, how do you start building a backyard water garden? Here are a few things you will need to do to start designing your backyard water garden. Your construction begins with planning. You need to have a pretty good picture of what you want your backyard water garden to look like, both, in your mind and also on paper. Having a written plan will guide you through your entire work and help you estimate your cost of materials and labor. You wish to hire people to help you with your work or you can save a little and learn some by doing it yourself! Designing your garden will require you to really investigate your garden and look at different possibilities. Here are a few things you need to consider to come up with a good design. What do you already have that could be useful? What obstacles do you need to work around? What are the things you want changed or removed? 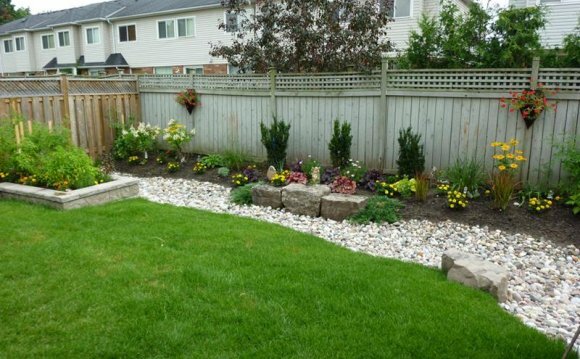 You could consult a good landscaping company to help you with your designs. They can be quite reasonable. Or look at some websites that have great backyard water garden design ideas and design it yourself. I recommend that you visits some of the sites listed below at the end of this article. A sketch will be also helpful in case you need construction permits from your local authorities, or from your local city council. To make an accurate design you will have to actually measure your garden and come up with an accurate layout. If you can use your computer for CAD (computer aided) designs, do so, or get help from someone who can. It will help you to come up with an accurate layout of your garden. Even if you cannot make an accurate design, don’t worry, you can always start working on a general idea. However, make sure that you have everything you need to obtain proper permits if you are planning to do major digging and constructions work in your backyard. Also make sure you know where all your utility lines are located, such as your water, sewage, electric and telephone lines. A little extra time will save you a lot of trouble and expense. Your pond and your fountain will become the center of attention for your backyard garden. There are several factors that will come into play when choosing the right kind of pond you want to have in your backyard. Your pond size will vary depending on the space you have available, the type of fish you wish to raise and the purpose of the pond. Though your home is your castle, there is no necessity to surround it with a moat. Here are 5 tips that will help you to make your landscaping feel more warm, welcoming and cozy. 1. Put some flowers nearby your entrance. Flowers make any area look more welcoming and attractive, so greeting your guests with Petunia, Snapdragon, Lily-of-the-Nile or some other garden flowers is always a great thing to do. What is more, to add some space between your house and the entrance, you can consider adding a little white fence. It will create an illusion that your front yard is bigger than it actually is. What is more, adding fence will create a great space for planting flowers to add some color and coziness. 2. Add rambling vines to make your yard look absolutely lovely. You can not deny that rambling vines always create romantic and even magical atmosphere. So why not to use this tip while decorating your yard? 3. To hide the unattractive driveway, consider adding some color, texture, and height. You can easily do it by adding various sorts of flowers. To start, create an island of green lawn right in the hub of a drive. Then add a couple of low boxwood hedges with flowers toward the back of your island. 4. If you want your yard to blossom and flourish bust still do not have enough time to maintain it, consider planting low-fuss lilies. Such flowers look absolutely gorgeous and come in the variety of rainbow hues, so you can pick the one you love most. What is more, low-fuss lilies do not care about the sort of soil, they love the sun and welcome hot, they do not afraid of drought. In other words, Crinums is an ideal flower for all those who are looking for low-maintenance solutions. 5. The last tip also touches the low-maintenance aspect. To make your life easier, group plantings into beds and islands. This will help you to avoid mowing and trimming around each individual plant, save a lot of time and even money. The first faucet was created by the ancient Greek inventor Geron, that was a metal pipe with a piston. For many centuries only wealthy people could afford to buy it. By 1920 the mass production of small, comfortable, light faucets with two handles, that didn’t not require complicated maintenance and installation, started. The prototype of the modern single-handle faucet was invented only in 1954. Since then, technology and design have stepped far ahead, and now you can call your plumber to install a convenient mixer with lighting, thermostat function, touch control and even with a display.